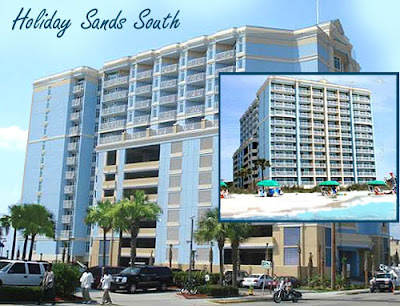 The Holiday Sands South spent the first part of its existence as a popular vacation hotel in Myrtle Beach. In the mid-2000s, it underwent a major renovation to become a luxury condominium high-rise complete with the kind of amenities you would expect to find at a luxury resort. Priced from under $100,000 to around $250,000, the one and two bedroom floor plans have floor to ceiling glass that offers stunning panoramic views of the ocean. Lounge around the outdoor pool or in the thick carpet of grass on the oceanfront lawn. 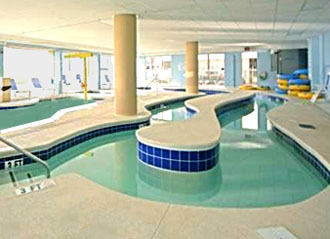 When you have had enough sun, relax in the indoor pool, float leisurely down the lazy river, or loosen those achy muscles in the indoor Jacuzzi. Keep to your fitness routine in the exercise room. Send emails to your jealous friends back home. Internet access is included. When your busy day is over and you don’t want to leave the resort, there is an on-site restaurant. 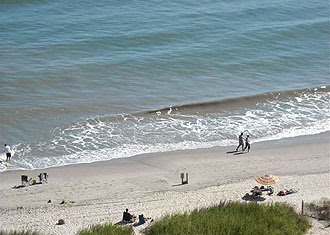 The resort is on the south end of Myrtle Beach, just a short distance from the Springmaid Pier where you can fish to your heart’s delight. Less than 2 miles from the airport, flying into from anywhere in the country is as easy as it gets. Market Common, Coastal Grande Mall, great restaurants, and all the fun and excitement of the Grand Strand are just a few minutes away. If you would like to know more or see current listings, please visit our website. Call our real estate experts to schedule a private tour of the Holiday Sands South condos for sale.